I am in love with serums, and right now my skin is still getting used to the change in seasons for cooler Fall weather. I discovered this wonderful product that was included in Rachel Zoe’s Fall 2018 Box of Style that I just received. 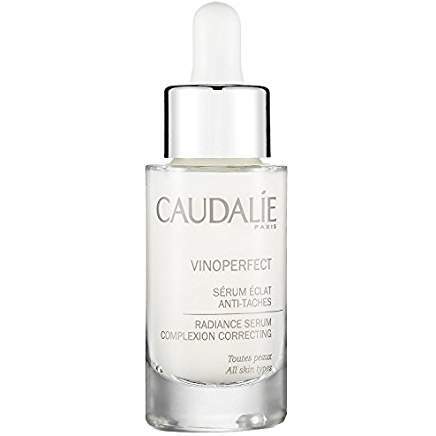 You will reveal fresher, healthier-looking skin with the Vinoperfect Radiance Serum from Caudalie. This award-winning anti-dark spot serum is ideal for enhancing all skin types. It’s oil-free and non-comedogenic. This amazing serum alleviates discoloration and unveils a more even complexion. This cult favorite brightening serum is powered by viniferine, a natural ingredient from grapevine sap that is 62 times more effective at brightening than vitamin C. Its lightweight satiny formula immediately absorbs into skin so it can get to work correcting dark spots such as acne scars, pigmentation, melasma, and sun spots. The serum also contains olive squalane, which is a non-greasy, hydrating ingredient that sinks quickly into skin to deliver moisturize. The serum works well under makeup for flawless-looking skin. For best results, use Vinoperfect Overnight Renewal Cream in the evening. Tip: apply under daily sunscreen for a more even tan. 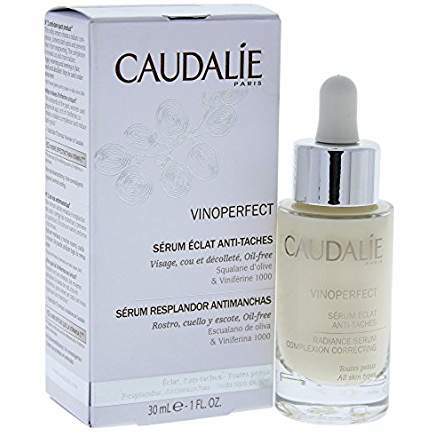 Vinoperfect Serum’s viniferine inhibits the production of tyrosinase, which in turn regulates the melanin leaving you with a smooth, more even tan. 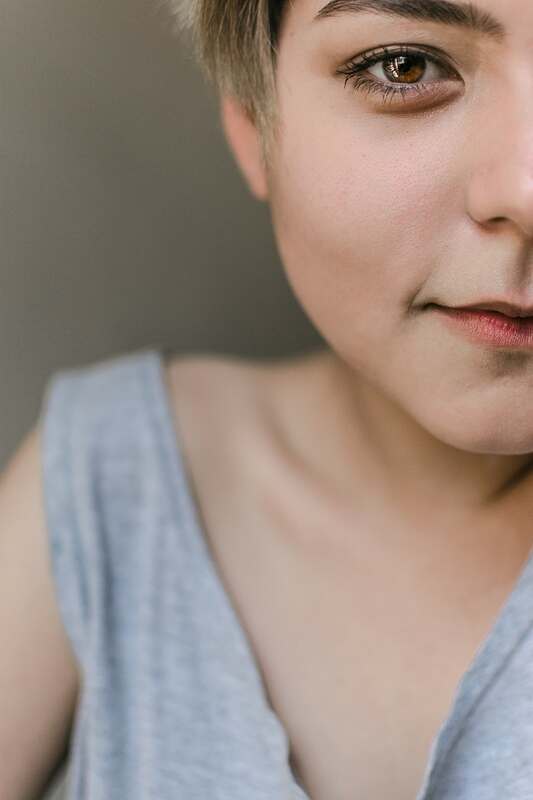 This product is vegan, safe for pregnancy and sensitive skin, non-toxic, non-photo sensitizing, cruelty-free, hypoallergenic, and free of all synthetic chemicals, fillers, gluten, and GMOs. It is a winner of Total Beauty’s 2017 Reader’s Choice Award for Dark Spot Corrector. When college sweethearts Mathilde and Bertrand Thomas decided to spend a summer working on their family estate in Bordeaux, France, they had no idea they were about to launch a skincare empire. After meeting Dr. Vercauteren, a Polyphenols specialist, they discovered the vast potential of utilizing grapes in skincare. In 1995, they created Caudalie and thus became the pioneers of luxury vinotherapy. Recognizing that vines, grapes and seeds contain multitudes of antioxidants and anti-aging properties, they became one of the earliest developers of resveratrol, now a skincare staple seen in many Caudalie formulas. Marrying old world ingredients with new world techniques, Caudalie remains a forerunner in the skincare community. Coming up on The Badass Writer: All about GacLife, a drink made from an amazing fruit from Vietnam that’s like the fountain of youth, a book review on Conquer Change and Win, and a series of articles on Oahu as we go on location in Paradise for the month of November. Please share this post on social media and subscribe to this blog! Thank you for joining me today. See you soon! I’m surprised to see the price is still decent in the US (esp. on Amazon) because I’ve been told French pharmacy product are awfully expensive overseas. This is pretty much the same price as in Europe. Caudalie is a good brand although I’m a not huge fan of its scent. This brand is new to me and it’s been a delight to try. I’m wearing it under sunscreen to prevent hyper pigmentation while I’m on vacation. The scent is very green, that’s for sure. I’m curious to try their other products too.